A resident of Chico, California, Thaddeus Kerns was inspired to pursue aviation at an early age. At sixteen he built and flew his own glider, and at seventeen successfully flew an airplane of his own construction at the 1911 Tanforan Air Meet. 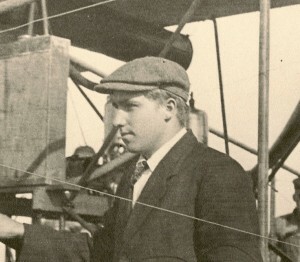 Kerns perished in an aircraft accident not far from his childhood home in Chico before his twentieth birthday, but created a lasting legacy as the region’s first aviator. 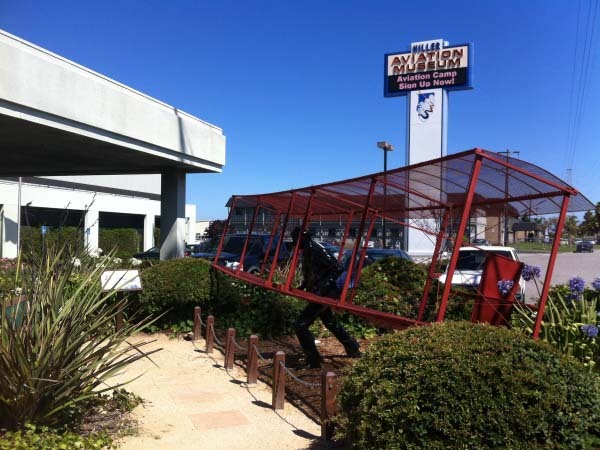 A life-sized sculpture of Thaddeus Kerns and his 1910 glider was crafted by sculptor John Chauncey Roll and emplaced in the Museum’s front parking lot at its opening in 1997. The memorial’s landscaping was completely renovated as an Eagle Scout project undertaken by Conor McCann from Troop 42 from the Pacific Skyline Council of the Boy Scouts of America. Tthe memorial was rededicated by Conor and representatives of the Kerns family in a ceremony held at the Museum on September 21st, 2013. The restored monument commemorates the achievements of the young aviator who brought the promise of flight to northeastern California over a century ago.